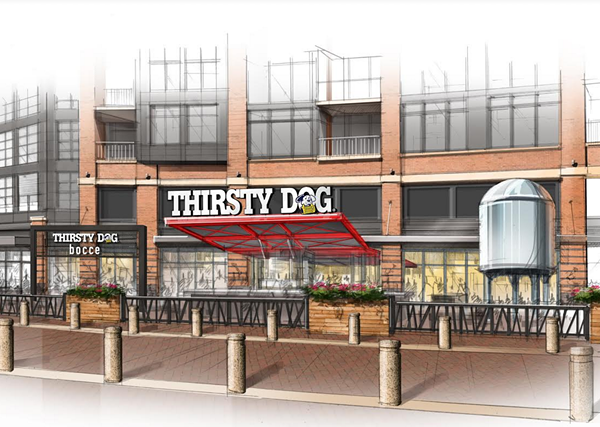 Thirsty Dog will open this Wednesday on the East Bank of the Flats. The Akron-based brewery is the latest in a second wave of openings after Crop Sticks and Crop Rocks closed last year. Backyard Bocce and Dante's Inferno recently opened as well. A 10-barrel system will handle brewing on premises. As for food, the brewpub menu will include "an array of sharable appetizers, featuring sauerkraut balls and assorted poutine style dishes. Locally made sausages and fresh Angus beef burgers are the centerpiece of the made-from-scratch menu. Dinner entrees will include house-smoked meatloaf, a Cleveland made kielbasa and pierogi platter and pretzel crusted chicken. Dinner sized salads and flatbread pizzas will also round off the menu," according to a press release. The dining room can seat 200, including 32 at the bar, with an additional 25 guests outside on a 2,500-square-foot patio.